We are so HAPPY you are stopping by! WOW! This month is jam packed with family time and events. I am going to enjoy every minute of it! Sadly, this will be our last Currently post. Listening To: My husband loves to watch shows on ID. Today it is unsolved mysteries. 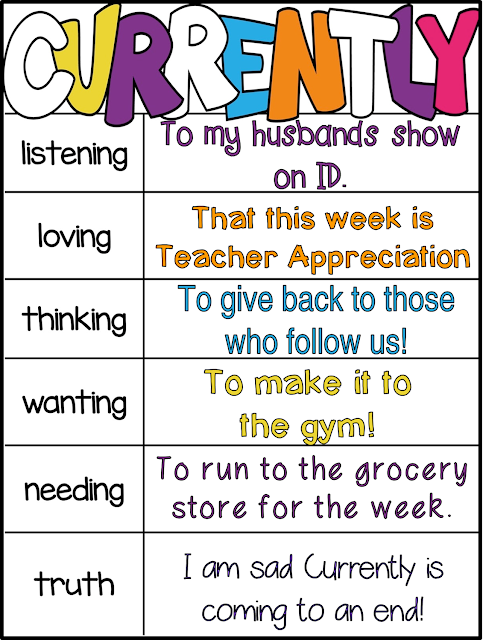 Loving: This week is Teacher Appreciation week! We can't wait to show teachers out there how much we appreciate them. Make sure you drop back by our blog to check out all the fun! We also can't wait to appreciate our AMAZING teaching staff at work! We work with so many WONDERFUL teachers! Thinking: We'd better get in gear and get it started! If you aren't following us on IG, make sure you drop by and enter the 1st giveaway! Click on the picture & start the loop to enter! Wanting: To make it to the gym and workout. Needing: To fill the fridge ... it is looking empty and people keep asking me, "Do we have ANYTHING to eat?" Fact about me: I really don't like grocery shopping. Truth: I am sad Currently is coming to an end! I really enjoyed reading about others and connecting through common interests! We hope your week is full of smiles & that you feel appreciated for all of your hardwork and dedication to teaching! 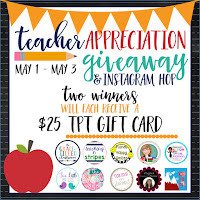 I love your teacher appreciation giveaway - I'm definitely going to have to check it out on IG! LOL...I love ID shows, but my boyfriend makes me change them. For him, it's like being back at work! HAHA my husband is a CSI and he loves ID! I saw the giveaway and entered already! Very cool! Have a great week! Teacher Appreciation ~ End-of-the-Year FUN!